This intriguing CD aims to set up a kind of two-way cultural traffic between European Baroque music and Argentinean traditional songs. 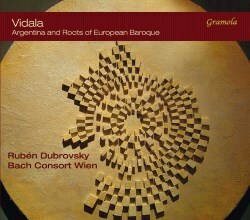 The title 'Vidala' refers to a type of vocal music found in both Argentina and Bolivia; Rubén Dubrovsky is the driving force behind this recording, and plays cello and various folk instruments. In the booklet notes, he explains how, although Spanish Baroque music undoubtedly travelled to South America, dance-forms such as the Sarabande went the other way, and in their turn exerted an important influence on the music of Europe. These cross-currents are immediately made explicit on track 1, with Vivaldi's wonderful variations on La Folia, an ancient melody that has been used by countless composers from Corelli to Rachmaninov. To the basic ensemble of two violins, cello and continuo Dubrovsky himself adds charango - an Argentinean guitar-like instrument - and percussion, in the form of frame-drums as well as a davul, a Turkish instrument that found its way to Spain. The mournful, stately dance is gradually transformed into something mesmerisingly earthy, with an increasingly feral rhythmic drive. That productive interaction is preserved throughout in a variety of numbers. There are more composed numbers by people such as Piccini and Marini, alongside either traditional melodies such as La Bolivianita on track 3, or pieces in traditional style by various popular musicians . whose dates aren't given, and I have been unable to trace. La Bolivianita is a good example of the essence of Vidala, with its lively rhythm and its minor key melody played mainly in thirds by the two violins. As with Spanish folk music, there is a prevailing mood of sweet melancholy, enlivened by the hypnotic dance styles. That mood of melancholy is heightened in the vocal numbers, of which there are several, by the plaintive tones of Argentinean tenor Francisco Brito. He is a real stylist, clearly understands this music instinctively, and has exactly the right kind of voice for it. The instrumental contributions of the Bach Consort Wien are similarly of a very high standard, and there is a sense of huge enjoyment in the challenges presented by the music. This is a fascinating and rather special issue, which manages to shine new light on both genres of music - popular styles of Argentina and Baroque chamber music - that make up its contents; I found it engaging and delightful.